Amy Winehouse’s main stomping ground was Camden Town: she once described it to her father, Mitch, as her ‘playground’. Many parts of the city still hold a unique piece of Amy’s incredible history, so to celebrate the Queen of beehive hair and winged eyeliner, here are the top places in London to visit if you’re an Amy Winehouse fan. Allegedly Amy’s favourite tipple was a ‘Rickstasy’, a drink unique to the Hawley Arms in Camden, consisting of vodka, banana liqueur, Southern Comfort, and Baileys. An eccentric drink for the Queen of eccentricity. Sadly the pub was a victim of the Camden Market fire in 2008 but after great fundraising efforts it reopened its doors, much to the delight of fans interested in trying Amy’s drink of choice. No. 30 Camden Square marks the spot where Amy Winehouse passed away in 2011, in the house where she lived for many years. Fans frequently flock to the square to lay flowers and to leave a message on the road sign, sharing their love of the UK singer. Camden Council has even had to issue a statement urging people not to take these signs as 14 have gone missing over the last 6 years. If you’re a devout Amy Winehouse fan, be sure to make the pilgrimage to this sentimental spot. This iconic music venue marks the spot where Amy Winehouse played her last ever UK gig on 20 July 2011. Amy surprised crowds by joining her god-daughter Dionne Bromfield live on stage as she supported UK band The Wanted at iTunes Festival. The pair performed a heartwarming rendition of ‘Mama Said’ to the Chalk Farm audience. The Roundhouse holds regular tribute gigs for the Camden Town star, to celebrate her musical memory. In the newly refurbished Stables Market, you’ll find a lifesize bronze statue of the powerhouse singer, right in the heart of her favourite hangout spot in London, Camden Town. Amy’s father was heavily involved in the design, guaranteeing an accurate representation of the beloved songstress. When it was first unveiled the statue had a single red rose placed in her hair, to symbolise the love and loss of a musical legend. 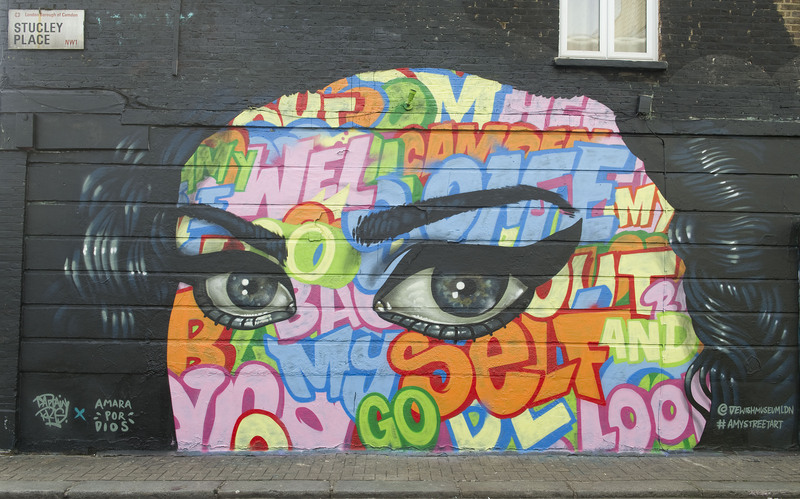 Earlier this year, the London Jewish Museum launched a street art trail, offering a unique experience to guide visitors around the London borough that captivated Amy’s heart. All in all, the trail takes around 45 minutes to walk, starting at Lidlington Place (near Mornington Crescent tube station) and finishing at the museum itself. 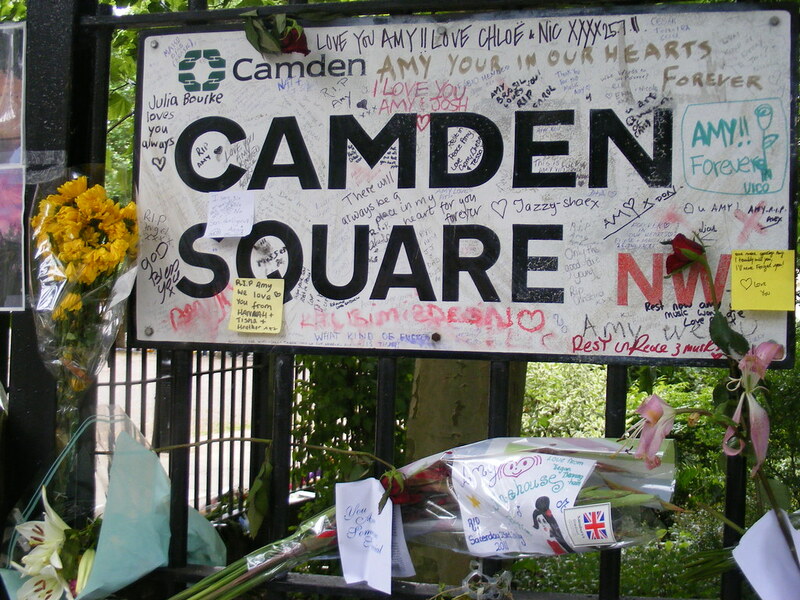 Fans can get a feel of the area Amy loved dearly, as the tour passes through Camden Market (where Amy got her first job selling candles) and by the pubs she used to visit. Touching artistic tributes make this walk very worthwhile for any Winehouse fan. One of the best spots to catch a glimpse of London’s spectacular skyline, it’s not hard to see why it was a firm favourite with the music legend, who loved nothing better than switching off from fame. Amy spent a lot of her time during the summer months at Primrose Hill and she could often be found lounging in the park with her on-off love Blake Fielder-Civil. At the top of Primrose Hill, the whole of London lies beneath you, so if you’re looking to unwind with a scenic view make sure you pay it a visit. Retrace the steps of Amy Winehouse herself in her iconic ‘Back to Black’ music video and walk through the gravestones at Abney Park Cemetery. Situated in Stoke Newington, this 19th-century cemetery is no longer in use but is still open to the general public. The cemetery has an incredibly gothic vibe to it, especially with overgrown ivy running over the gravestones and it is known as one of the seven Magnificent Cemeteries in London; perhaps why Amy opted to feature it in her monochrome music video.